See scan - perfect condition. This is a nice and rare Imperial / Royal Austrian WWI combat wound / death medal - LAESO MILITI MCMXVIII with the portrait bust of King Carol / carolus at obverse. Good and perfect condition zinc class / issue. 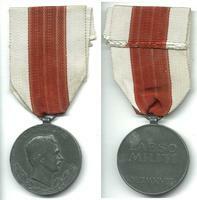 Nice militaria / military collector piece and one of the nice Austrian medals.